Asian Garlic Tofu cooks up crispy with tons of salty, sweet, and spicy flavor. Serve with broccoli and rice for a fantastically delicious vegetarian meal. My daughter has been a vegetarian for 2 years. Or maybe it has been 3 years. I can’t even remember. Every now and then I like to share some of her favorite things to eat like Orange Cauliflower and Vegetarian BBQ Nachos. She doesn’t like beans so tofu is a major source of protein for her. I actually really like to cook with tofu and eat it as well. I love that it has a very neutral flavor that lends itself to being paired with all kinds of seasonings and ingredients. The longer you let it sit, the better. And replace the paper towels a few times. They will get completely wet. 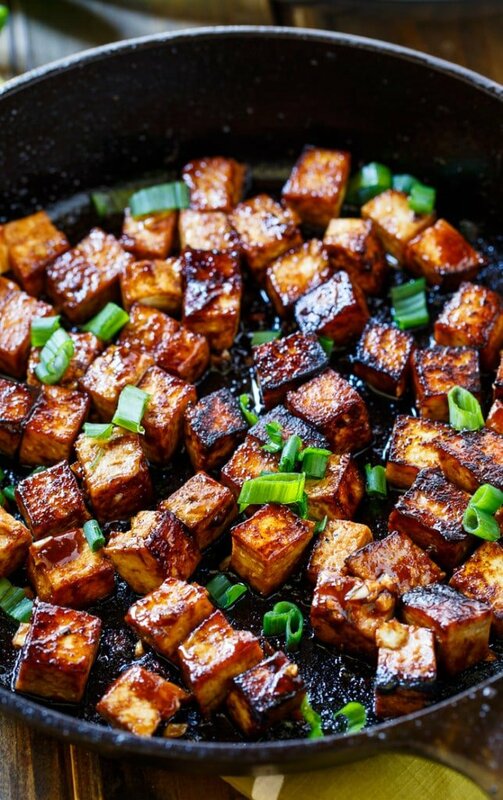 A quick marinade in a mixture of Hoisin sauce, soy sauce, ginger, garlic, red pepper flakes, and a little sugar gives the tofu plenty of flavor. One more trick to crispy tofu is cooking it in a cast iron pan and heating it well before you add the tofu. Move the tofu around as little as possible. I let it get a nice sear on the bottom and then flip the pieces and let them get a sear on a second side. 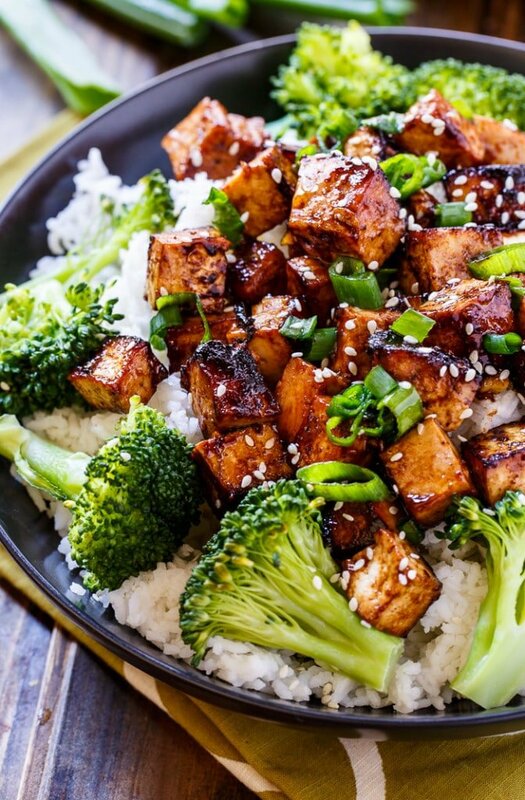 Asian Garlic Tofu is a vegetarian meal full of salty, sweet, and spicy flavor. Remove tofu from packaging. Place about 4 paper towels on a plate. Set tofu on top of plate and cover with more paper towels. Place a cast iron pan or something else that is heavy on top. Let sit 30 minutes. In a medium bowl, stir together Hoisin sauce, soy sauce, sugar, ginger, garlic, and red pepper flakes. Cut tofu into bite-sized pieces. Place in bowl with sauce and toss to coat. Let sit 30 minutes. Heat olive oil in a medium cast iron pan over medium-high heat. Once really hot, add tofu. Once nicely seared on the bottom, flip over. Continue to cook until seared on bottom. Drizzle with sesame oil and remove from heat. Sprinkle with green onions and serve with rice. This entry was posted in Vegetarian and tagged tofu, vegetarian. Bookmark the permalink. How much tofu? It says one package but they come in various sizes… 200g, 400g? I didn’t see at what point to add the broccoli. Do we just steam and add last minute or toss in the wok with the tofu? I think this is quite good. I had no trouble getting a good sear on the tofu. I think the Hoison has so much sugar in it that I can’t imagine having trouble browning the tofu. As another reviewer suggested, I did not add the additional sugar. I think that doubling the sauce would be a good idea because my end result was pretty dry. This was quite delicious. I could never get my tofu to really sear though, not without blackening them…which that blackening isn’t good for you by the way. Also I used organic tofu..tofu is one of the most GMO’d foods you can buy.. pretty much a pesticidal plant these days. But, I followed this recipe ..made a little extra sauce and sauteed the broccoli first in the extra sauce and put aside then went forward with the tofu… excellent. Thanks for the note about pesticides. So many women endanger their families with invisible cleaning poisons, toxic elements (invisible like pesticides) without knowing the hazards. Men too… cooking isn’t just a woman’s job.. Absolutely stunning flavor.. The tofu is so yummy..
We add Brocolli beans capsicum to the tofu mixture add make a stir fry alongside thr rice .. Goes really well. Omg so good and filling!! We replaced the rice with Quinoa and it was just as good. Thanks for sharing! Great tofu recipe! Followed directions and turned out as stated. Added broccoli to pan, after removing tofu, to saute with additional olive oil. Returned tofu after broccoli was adente . This is my first time making tofu. I couldn’t get it to crisp up. What did I do wrong? After you cut the tofu in cubes, coat lightly with cornstarch then pan fry.. It could be many factors. Make sure you buy firm or extra firm tofu. Make sure you get the water out either by pressing or you can freeze it and then thaw. Make sure the pan is hot before you add the tofu and yes, cast-iron is best. Lastly, patience is key. Wait for it to sear before you flip it on all sides. I have also covered it with a dusting of corn flour. It works either way. Good luck! 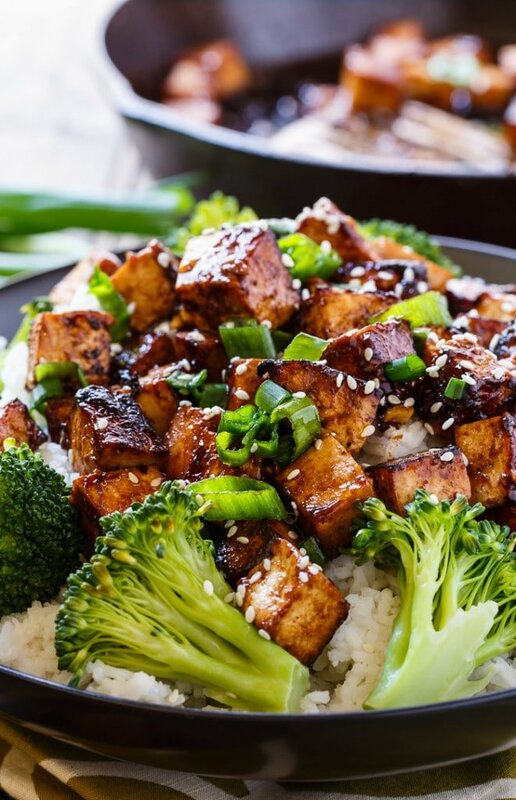 This is the best tofu recipe I have come across, yum! Thank you for sharing this great recipe! I will definitely make it again. Cook time 1 hr 50mins?!?! That includes marinating time. Cook time is 10 mins. If you have a salad spinner, use it to drain the tofu. Cut them in cubes first. It always worked for me! Thanks so much for the tip, it worked great. Using the spinner doesn’t break the tofu? It shouldn’t break the extra firm tofu. Use extra firm tofu. 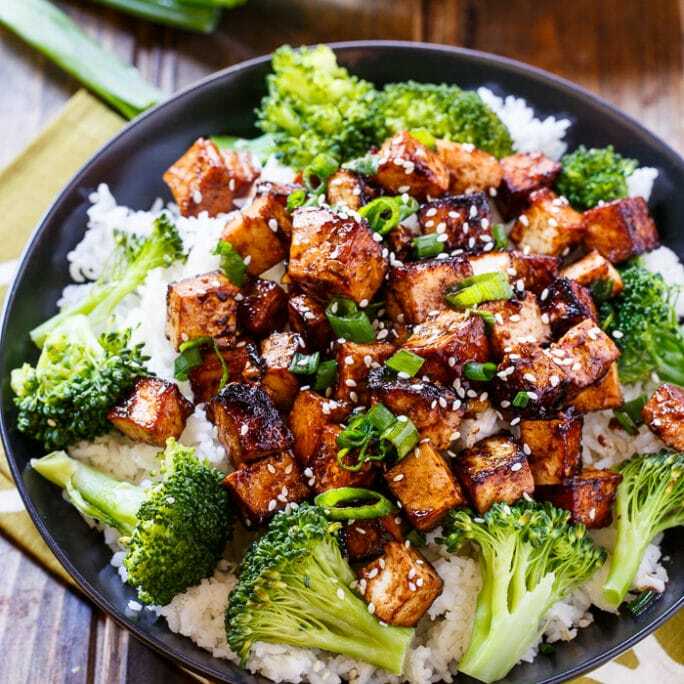 The best tofu bowl! It was very tasty! I added steamed broccoli. I see broccoli in the pictures but nowhere mentioned in the ingredients or how to prepare it. Any suggestions? wash it chop it cook it ????????????????? I am not going to add sugar, Hoisin sauce is sweet. Steam it in your steamer basket for about eight minutes. A very easy and tasty dish that doesn’t need the sugar. You want crispy tofu?? Freeze it first, like others have commented. Thaw, squeeze and then dredge in cornstarch. Fry in hot oil. Thanks for the great tip Gail! I’ve never frozen it but I do shake the cubes in a bag with cornstarch, s & p, and sometimes a bit of chili powder to deepen the color. May I suggest peanut instead of olives oil? Olive has a low smoking point while peanut is high. It also adds to the Asian flavor & smells incredible!? It is very interesting recipe. Tofu was perfectly cooked but the sauce was way too sweet. The Hoisin sauce I am using contains a lot of sugar and adding an extra spoon of it is not necessary. Next time I will definitely skip the sugar and add a lot of veggies. You actually made a mistake with the directions on how to prepare this dish, it does not follow the video added for preparing the tofu. 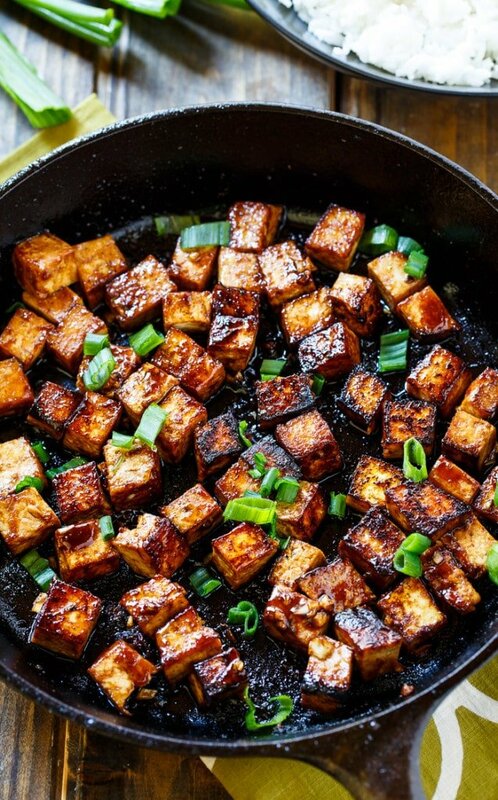 In your directions for preparing the tofu you state you need 1 teaspoon of olive oil and then the 1 teaspoon of sesame oil for drizzling the tofu. However, in the video you do not show that you drizzle the sesame oil, but that you use the sesame oil to pour into the cast iron pan instead of the olive oil; so basically in the video you did not use the olive oil. I cooked my very firm tofu (drained, and froze it) for a long time, finally got tired of waiting for it to brown, and turned it up to high, still didn’t burn. look burnt..you can make firm tofu brown and crispy without burning it. Buy firm tofu and toss it in your freezer. Let it freeze solid and then thaw. Freezing changes the structure of the tofu and you will end up with a “meatier” texture. Also, buy a tofu press or make one. I made one out of two small cutting boards; drilled holes; and added some screws and wing nuts. After you’ve thawed the tofu, put it in the press. As water drains, you may have to tighten. The longer you can leave it in the press, the better, so you really get all the water out. After the tofu has been pressed, cube it and coat the cubes in corn starch. Never use flour on tofu. Corn starch does a beautiful job in terms of browning the tofu. Then follow the rest of this recipe! Or invent your own! Coat it in corn starch and then put it in the spice mix? or coat it in spice mix and then sprinkle cornstarch? I tried this for the first time today…. AMAZING!!! calorie count seems high, does that include the rice? Delicious and plates up beautifully. Didn’t use cast iron skillet but a regular non- stick and I replaced the white rice with Minute (10 minutes) multi-grain medley (brown, red, wild rice and quinoa) for time saving. My husband told me I put my foot in it, meaning he loved it and we will be having this on a regular. 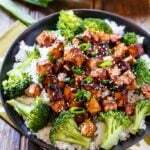 Very good recipe, especially using home-made hoisin from https://www.bbcgoodfood.com/recipes/3183674/hoisin-sauce- . A bit strange that all the pics above show the dish made with broccoli, but there are no veggies in the recipe. I made mine by making extra sauce, and first quickly stir-frying broccoli, sliced carrots and red bell pepper bites. I set aside the veggies after they were al-dente, then cooked up the tofu. Added the veggies and extra sauce back into the pan at the end to meld. Absolutley excellent. This recipe is a keeper! Would also work very well with other substitutes like Quorn. I have never been a fan of tofu; however, this recipe is VERY GOOD!! I will definitely make it again, but adddng a little more garlic and pepper flakes. Thank You for sharing. 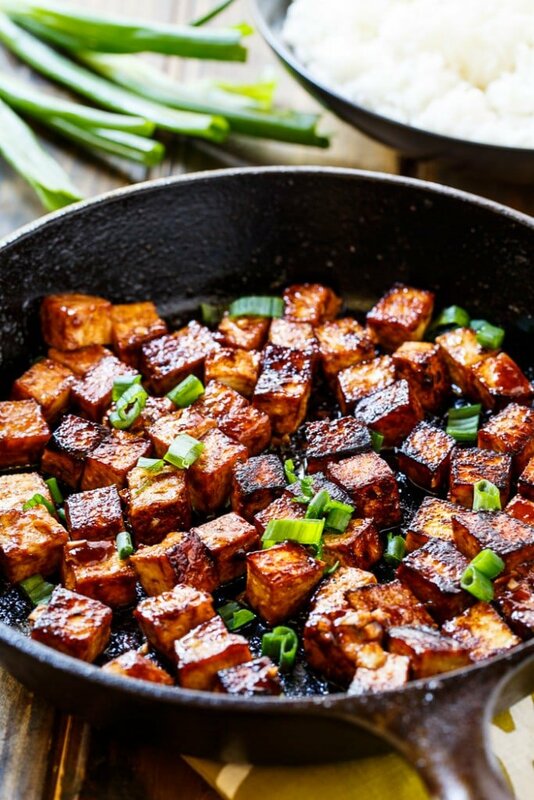 Hey, so I’m currently making this, and the something heavy on top of the tofu caused it to crumble in some places- it’s just an issue I saw, maybe I wasn’t careful or bought low-quality tofu but maybe give a few other examples instead of just the cast iron pot. I just made it myself and realize the recipe calls for super firm tofu. Was your tofu super firm? Must be the super firm one. There were 3 types at Sprouts. I usually put a plate on top of the tofu with two cans on top of the plate for weight. I think a cast iron pan can be a little too heavy. You just need enough pressure to force the water out. Does tha calorie count include the rice? I tried the recipe last night and served it with broccoli stir fry vegetables and quinoa. It was delicious. This was my first time purchasing, cooking, and eating tofu. I will definitely cook it again. I didn’t use a cast iron skillet and didn’t have a problem cooking the tofu. Also, I am not someone that cooks a lot. It tasted like something from a restaurant. Pretty sure you are never supposed to heat up sesame oil. It should only be used for flavor after all the cooking is one. Tracy Sherwood you are correct, use peanut oil to cook with instead, then sprinkle on sesame seed oil, or hot Asian oil. The video says to fry the Tofu in the sesame oil instead of the olive oil. In the recipe the sesame oil is drizzled over afterwards. Going to try the recipe later and will comment. This was my first time making tofu and it was excellent! My husband did not think he would like it and opted for baked salmon. Needless to say, he loved the tofu and could not believe it was really tofu. Preferred it over the salmon! I added a few crushed peanuts over it left over from a General Tso chicken from earlier today. Will definitely be making it again! I made this dish tonight. First time incorporating tofu in a meal and it was delicious. Although I have a cast iron pot I opted to cook it in a wok and it came out just fine…thanks for the great recipe. Amazing! I didn’t have any problems with the tofu sticking to the cast iron! Super easy will make again. My tofu stuck and burned!!! Marinade excellent but because of sugar content esdy burn. Any suggestions as your dish didnt have this issue? If it burned, your pan was too hot, turn the heat down. If it stuck, you may not have used enough oil or your pan may not be seasoned well enough. In my cast iron, with the sugary (hoisin and sugar)marinade, the sugar burns if you cook it like instructed. I would recommend marinading, removing as much marinade as possible, then searing, and still be careful about it. Then add more marinade as desired on top of the dish. The picture looked so good I had to try it. I have never had luck frying tofu before. It always falls apart. I followed your directions (except the part about the cast iron pan because I don’t have one). I resisted my urge to “stir” fry and let the tofu set for a full 5 minutes on one side before turning it and then another 5 minutes on the other side. It came out perfect! Just like your picture and tasted great. Be careful not to top with too many scallions. Next time I am going to try marinating the broccoli and frying it at the same time as the tofu. If I don’t have hoisin Sauce but really want to try this. Anything else I can use ? I know it may sound weird, but of the suggestions already given, I second the suggestion of BBQ sauce to substitute for hoisin sauce. This is the first time I’ve made tofu and it’s actually turned out good. Thank you! Excited to make this tonight! I found a recipe for some lo mein, do you think this would go well with the noodles? I made this and followed the directions and it came out soft and not crispy at all. It had a sponge like consistency so I didn’t even attempt to put it near my mouth. I am trying to go vegetarian but if tofu is like this I’ll stick to eating animal corpses. You have to make sure you drain the tofu and wrap it with paper towel multiple times until the tofu is dry. When cooking it make sure to have it on medium low and cook it to desired texture. Made this it was a huge hit with everyone. Will make it again and agin and again. And Stan you are an idiot. This recipe is so DELICIOUS! Thank you so much for sharing . Will be making this every week. My family loved it. Life -changing, and tastes just like restaurant style. Thanks again !! I added broccoli and water chestnuts, but doubled the sauce recipe…because it is just that yummy!! This will be a family favorite from now on! Why is the same photo shown again and again. And to be honest, your daughter is irrelevant. You are such an idiot. Stfu and show some respect. It’s not the same photo. Her daughter is relevant because this recipe is one of her daughter’s. You, however, are not relevant in the slightest. Can’t wait to try this for dinner this week. Looks amazing! This is a tofu dish packed full of flavor! Love, Love, Loved it! Thanks for sharing! A new favorite. So glad you enjoyed it Cindy! Made this recipe and also added mushrooms. SO delicious!!! Thanks for sharing. I’ll definitely be making it again. I added mushrooms as well…. beautiful! Great recipe. Just tried this recipe and it has so much flavor. Really impressed! To bump up the flavor & protein, while in keeping with the Asian nature of this dish, add a few tablespoons of smooth peanut better along with the sesame sauce before serving. Also, I sautéed some onion and bell pepper, then added the tofu. I think you could blanche broccoli florets & add them, or string beans or any other fable veg. Thanks for the great tips! Will have to try that! What if you don’t have a cast iron pad ? Is a regular fry pan ok ? Yes, but it won’t conduct the heat as well so you won’t be able to get the tofu as crispy as you would in a cast iron pan, but it will still be good. A tip to press tofu…Instead of wasting paper towels just use kitchen towels. Use the ones that don’t have the “fuzzy” texture so you won’t end up with fuzz in your tofu of course. Less waste and soaks water better. Also when freezing tofu you can crumble it after, and add to sauces to make a meat like texture. Especially good in marinara, or if trying to hide tofu from family members that freak out over tofu in general. Just wanted to add comment since it seems many aren’t familiar with tofu yet here. So versatile and easy! For added nutrition boost, swap quinoa for the rice. Love this recipe, so good! Sometimes I put one paper towel on a towel, just in case of fuzz. Here’s a tip for better textured tofu. I buy hand cut non-gmo tofu that comes tubs so it should work with all types… When I bring it home I take it out of the package and put it (w/o liquid) in the freezer in freezer bags. When I need to use it, I defrost and press it. More liquid comes out plus it has a much firmer texture. That’s a great tip Laura! Thanks for sharing. Will have to try it soon! Will spraying the pan with non-cook cooking spray like Canola work instead of the other oils? I am trying to avoid the fat from regular oils. As long as you give it a really good coating of spray, it should work fine in a nonstick pan or a well-seasoned cast iron pan. The recipe calls for 1/4 teaspoon, not 1/4 cup, of red pepper flakes. Lili try again with 1/4 tsp of crushed pepper only. It was delicious and worth another try. I used Oyster sauce since I did not have Hoisin Sauce, it did not work the Oyster Sauce was too salty. Did try with Hoisin the next time and it was great. I tried this meal I haven’t tried it yet cooking now, I added broccoli and the remaining sauce in a skillet with more sauce . I didn’t have any hoisin sauce I looked it up on google and there was a simple hoisin sauce so I made that, I couldn’t find it in the store either way I can’t wait to try it for dinner. Hi! I am currently making this delic meal, however I bought only medium firm tofu.. hopefully it works out. I noticed your recipe instructions missed out on when the broccoli comes into play here? Does this recipe really take 2 hours 50 minutes? I’m draining the tofu right now so will soon find out. I just wonder if there’s part of the recipe missing, or (I hope) the timeframe is a typo. That is a typo! Thanks for catching that. The cook time should only be about 5 minutes! I didn’t have extra firm tofu – hub, bless his heart bought me firm. So I wanted to cook the tofu a while before the sauce to see if I could firm it up. (Had pressed it in paper towels for over an hour)I coated it in cornstarch and fried it in the cast iron pan with Pam . Then put the sauce on, and cooked it some more. The texture turned out better than I expected, And the sauce was mostly delicious (!) but the sauce was just a tad bitter. Any thoughts on what I did wrong? Could the ginger be the culprit? I’m more of a slap-dash cook and not sure I measured the ginger accurately…? Or do you think the issue was technical? Thanks so much for this recipe! It was so easy! Did you add the sugar ? I pulled the tofu out of the marinade to fry it. Forgot the sugar and the sauce was bitter, added it and the sauce was perfect. I put the tofu back into the sauce when the tofu was cooked, it did not taste bitter. You might want to try it that way Stef, good luck. Just made this tonight, it came out great! Awesome recipe. The only change I made was that I used brown sugar instead of white sugar. It’s super important that you press the tofu before marinating it otherwise it’ll just be a watery mess when you fry it. Remember not to use too much oil when frying the tofu, use just a very light amount to coat the pan so the tofu comes out nice and crispy. As an extra tip serve this with a little balsamic glaze or reduction on the plate to dip the tofu in! Delicious! Thanks for all the great tips! I will have to try a little balsamic glaze. That sounds wonderful! We love tofu even though we’re not vegetarians, I make something with it at least once every two weeks. This sounds like a great recipe, the tofu looks so sticky and delicious. I like tofu as well but I still have yet to really really cook with it at home! This looks fantastic – love how crispy and browned it is! Thanks for letting me know Stella. So frustrating. I will check it out. Ah! This makes me salivate! It’s such a lovely recipe! I love the char on the tofu and the sweet – spicy – sour- salty flavors of this marinade make me want to dive right in! This is clearly one of the best Asian lunch / dinner options for vegetarians! Love it! Very good recipe. When browning the tofu, I noticed the area of the cast iron pan that had more oil did not char the sauce. Next time, I’ll make sure to place tofu cubes in the area of the pan with excess oil. I am stuffed! Couldn’t stop eating this bowl of deliciousness! This is the best tofu recipe to date! Came out perfect. I added carrots and mushrooms to the broccoli.